He heard it from Mike Boyle, an internationally known expert on strength training who presented at a seminar Andy attended. On his website, Mike says he heard it from Canadian physical therapist Diane Lee. Wherever the quote originated, Andy says the words run true, especially this time of year. The snow is disappearing, the sun is warmer and it’s nice to be outside. Everyone has the thought that they should start running. While their intentions are good, the idea is not. People are generally not physically ready to run and if they are, they usually overdo it. We carry this notion that “I used to run 2-3 miles every day” and believe we can hop right back into it with no preparation. This all or nothing approach, along with our inflated egos, takes over. We start running and pretty soon, trouble sets in. You feel pain in your feet, calves, knees, hips or low back — overuse injuries. All caused because we think we can jump right in where we once were. Only you’re just setting yourself up for failure. Don’t burst out of the house and try to run a few miles. Instead, start with a walk or a walk/jog program. Try walking for two minutes, then a light jog for 30 seconds. Repeat. 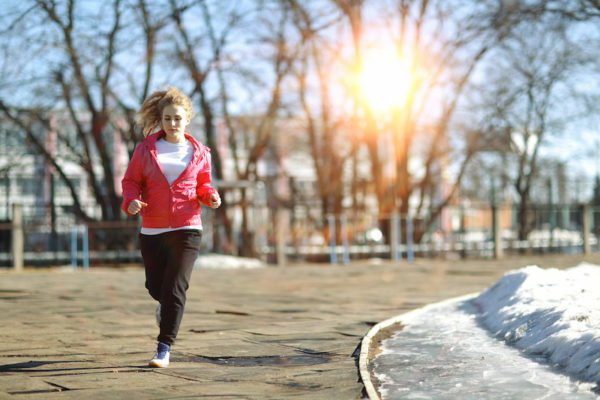 Slowly decrease your walk time and increase your jog time. Not only will this allow your body to adjust to the change, but you’re more likely to stick with it. Following this approach should decrease your chances of an overuse injury and set you up for success. Above all, you’ll have more fun!